Thanks to Twitter and Fangraphs, one of the most popular things for baseball fans to is argue over a player's Hall of Fame candidacy years and years before said player appears on a ballot. After some careful research, I've concluded everyone is always wrong about everything. No matter how much time is spent on analysis, there is going to be some yahoo who still thinks pitcher wins and RBI determine the greatness of a player. We might as well just open the Hall of Debate. 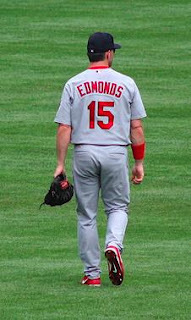 Where Edmonds fits into the Cardinals' roster is unclear. The team Will Carry several bench/outfielders into spring training, including Allen Craig and Jon Jay. Craig, a righthanded hitter, will also get playing time at third base. Jay, a lefthanded batter, can play all three outfield positions. Jay not only is the incumbent for the role that Edmonds could ostensibly take, Jay also has Edmonds' signature No. 15. The 40-year-old missed all of the 2009 season and spent time with the Brewers and Reds in 2010. In 272 plate appearances, Edmonds hit 11 home runs and a .276/.342/.504 line. His 2.8 WAR was over a win more than Jay and Craig combined. I always liked Edmonds and was sad to see him leave Anaheim. But Adam Kennedy was a beast in that 2002 run to the championship. It's never too early, right? If Edmonds were to retire today, would his resume pass the Hall of Fame eyeball test? He has a case. But if Tim Raines can't get in, I wouldn't start writing a speech just yet. 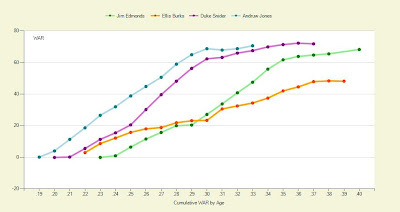 Baseball-Reference lists Ellis Burks, Duke Snider and Andruw Jones as Edmonds' closest comps. And of course, here is their cumulative WAR Grid by age. Snider is in the Hall. Burks debuted and fell off of the ballot in 2010. Edmonds and Jones will have some pretty interesting cases. Jones was really, really good before mysteriously and completely falling apart. I did see him a little too often at the Pink Pony in Atlanta now that I think about it. I'd have to think long and hard about giving Edmonds my imaginary vote but right now I'm leaning Hall of Famer. Plus, who knows what metrics we'll be using in five or six years or if we'll be enslaved by robots by then.